Massie Heritage Center - Your First Stop in Georgia's First City will greatly enhance your exploration of Savannah. As Savannah's only museum for local history and architecture, Massie's interpretive exhibits provide an exciting and engaging experience for guests of Savannah. Massie is listed on the National Register of Historic Buildings. 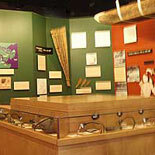 As Savannah's only museum for local history and architecture, Massie's interpretive exhibits provide an exciting and engaging experience for tourists to Savannah. 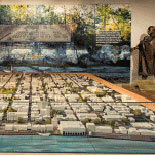 Massie's hallmark exhibit, Savannah's Unique City Plan, features an interactive laser show presented on a one of a kind 3-D model of the city's Historic Landmark District. The classically inspired exhibit offers a taste of the architectural landscape of a 19th century city with images of seventeen different styles of architecture. Massie's one-of-a-kind Native American exhibit tells the story of the native people in Georgia and the southeast region until the arrival of Oglethorpe and the establishment of England's thirteenth colony. Savannah's Preservation Movement is told through artifacts and photographs chronicling the loss and regeneration of Savannah's Victorian District. 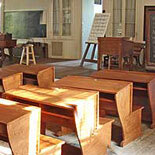 The Heritage Classroom allows visitors to take a step back in time to sit in the classroom of yesteryear, write on slate boards and even dress in costumes of the 19th century. 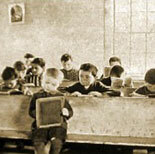 The History of Massie School Exhibit provides a record of the building's illustrious history as a school, Union Hospital, and Freedmen's Bureau School for newly-freed slaves. 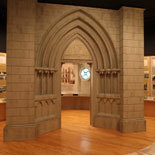 Get your e-ticket now to begin your tour of Massie Heritage Center. 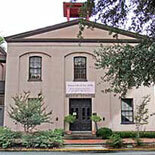 Learn about Savannah's history and her architecture beginnings. Greek Revival architecture at its simplest and best. Come go old school with us! Open Monday- Saturday 10 am - 4 pm ~ Sunday Noon - 4 pm.